Thanks to all CMSA members who have sent information for this newsletter: CMSA E-Newsletter 53, issued October 2018. 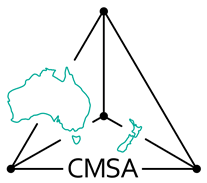 Please send news as soon as you have anything of possible interest to CMSA members and the combinatorial community, even if no newsletter is imminent! Email items to the Newsletter Editor (Kevin McAvaney): kevin.mcavaney at ozemail.com.au. ONLY in plain text please. CLOSING DATE for Issue 54: 31 March 2019. Old newsletters can be found here. To promote combinatorics within Australasia. To provide a forum for sharing combinatorial and related information. To keep CMSA members informed and in touch with combinatorial and related matters. The 41st Australasian Conference on Combinatorial Mathematics and Combinatorial Computing (41ACCMCC) will be held at the Millennium Hotel, Rotorua, New Zealand, 10-14 December 2018. The conference programme will include invited speakers, contributed talks in parallel sessions, a conference dinner and presentation of the CMSA prize for the best student talk, an excursion, and the CMSA Annual General Meeting. Researchers in any area of discrete mathematics and its applications are warmly invited. Prof Isabel Hubard, The National Autonomous University of Mexico. Closing date for abstract submission is Monday 19th November. It's best to book things early, in particular accommodation, as Rotorua can be completely booked out during December. The website for the Australasian Journal of Combinatorics is http://ajc.maths.uq.edu.au/, which has been recently reworked. The Journal is a 'diamond open access' journal: online and free for readers and authors. There are three volumes per year, closing respectively in February, June and October, matching the time of publication of the old paper volumes. Volumes are currently being uploaded in three parts. Part 1 of Volume 72 has been uploaded, and Part 2 will appear online shortly. The contents of all volumes, 1 to 72(1), are listed at the above web page. Part 3 of Volume 71 is a special issue in honour of Anne Penfold Street. Visit https://ajc.maths.uq.edu.au/?page=subscribe and sign up to subscribe to email notices whenever new papers are published. Submissions to the Australasian Journal of Combinatorics may be sent to ajc@maths.uq.edu.au. Only pdf files are required at submission stage. The Journal is now indexed by Scopus from Volume 13 (1996) onwards, and by Thomson Reuters "Emerging Sources Citation Index" from 2015 on. ISSN: 2202-3518 (online only, after 2013); 1034-4942 (paper, before 2014). This page was last modified on 3 January 2019, at 14:39.